208 in stock Need More ? 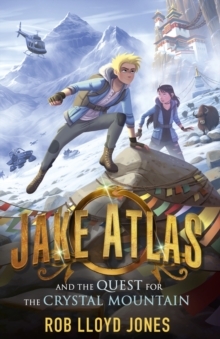 TREASURE HUNTER, TOMB ROBBER, TROUBLEMAKERJake Atlas and his family are searching for the fifth emerald tablet that will reveal the secret to the history of humankind. At China's Terracotta Army Museum, Jake retrieves a clue to a safe passage into a nearby tomb, where the tablet is believed to be hidden. But when a helicopter appears and blows up the tomb, the Atlases know they are being pursued by the People of the Snake. They must decode the rescued tablet and journey to the Crystal Mountain in Tibet to discover its store of ancient knowledge. But the mountain is guarded by a spirit, never to be entered. Not one to be deterred, Jake Atlas must overcome high altitudes, survive in a frozen landscape and drink far more yak butter tea than he'd ever imagined to discover the mountain's secrets. Another heart-thumping Jake Atlas adventure from an award-winning author, full of laughs and high-tech gadgets.